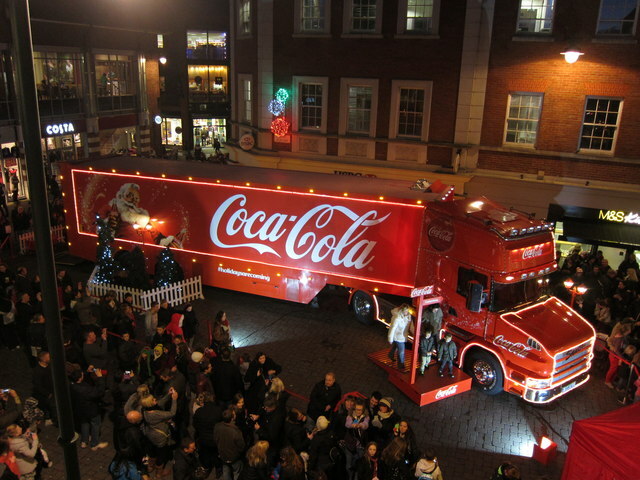 For years now, the annual tour of Coca Cola’s festive truck has been a staple of the Christmas period, signalling for many the beginning of the holidays. Now, amid growing concerns over the health implications of the sugar-laden beverage, public health experts in the UK are calling for the annual tour to be banned. Writing in the British Medical Journal, Robin Ireland, director of the Food Active campaign against rising obesity levels, and John Ashton, a public health consultant in Liverpool, argued that Coca-Cola was “intent on shaping public opinion through its marketing techniques” in order to “frame the debate around healthy weight.” They argue that this poses a serious risk the children’s health, as a single can of Coca Cola contains an absurd amount of sugar; seven teaspoons in fact, according to Coca Cola’s own website. Ashton and Ireland’s article in the BMJ states, “At Christmas, Coca-Cola’s marketing goes into overdrive as newspapers across the country regurgitate press releases for its Christmas truck tour, with advertorials promoting the truck as a Christmas tradition. And of course the truck is just the latest of Coca-Cola’s campaigns to become a holiday brand and, indeed, to help brand Santa Claus himself. “This Christmas the truck visited five locations in north west England in the first week of December: two in Greater Manchester plus Lancaster, Liverpool, and St Helens. Unfortunately, the experts involved told The Sun that their letter had received little-to-no media coverage. They told the newspaper, “Apparently Coca-Cola’s voice counts more than those of directors of public health.